This was my last cross-off before the end of my 30 before 30 list! Sure, it may have been one of the easiest things on the list, but it took some time and effort to actual plan and do haha. My friend and I headed to south Atlanta to check out the Starlight Drive-In Theater and I’d say we did it pretty darn well considering neither of us had been before. This is up there for one of my favorite things I did on my list. We stopped at Fresh Market and picked up dinner (salads), snacks (pumpkin popcorn), dessert (giant cupcakes), and wine. I had no idea how crowded it would be – I know it’s a zoo in the summer – but the weather was cooler and it was a Friday night. So we were the second car there when we got there….but it gave us plenty of time to get settled. We set up a pretty sweet and comfy pallet in the back of my Jeep. The weather was perfect for this semi-outdoor outing. The audio was so-so (tuned through the radio) and there are lots of distractions – cars driving by, people turning their lights on and off – so I wouldn’t try this seeing a movie that requires close attention. But I thought it was way more enjoyable than sitting in a stiff movie theater. I highly recommend this for a group outing (take multiple cars and park next to each other) or a date. They are open year-round so pack your blankets and get cozy! ignore the empty parking lot…. Categories: Merry Monday | Tags: 30 before 30, movie, starlight drive-in | Permalink. It’s a race against time until my 30th birthday and crossing items off my 30 before 30 list. I had a friend visit last weekend so I figured it would be a good time to cross something off. 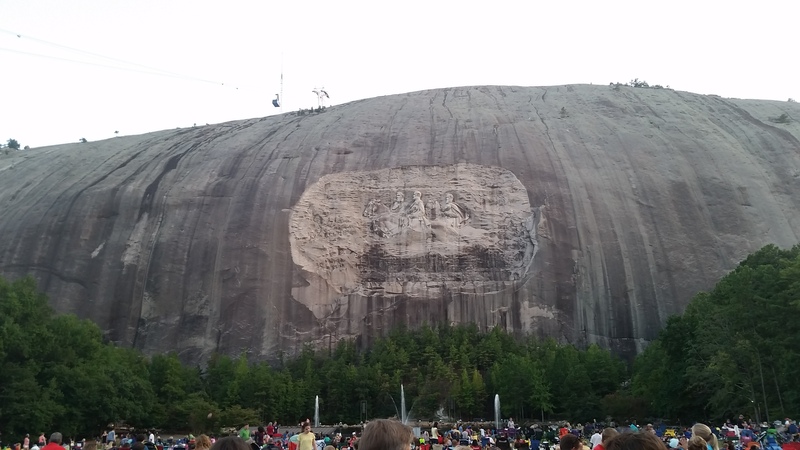 She – as are many of my friends – was interested in going to see the laser show at Stone Mountain. Everyone should see the laser show at least once in their lifetime. Although I grew up going and spent my first job working some shifts at the show, I had not been in many years. No, the laser show was not on my list but having a picnic was – and what better time than waiting on the lawn for the sun to set and the show to start?! 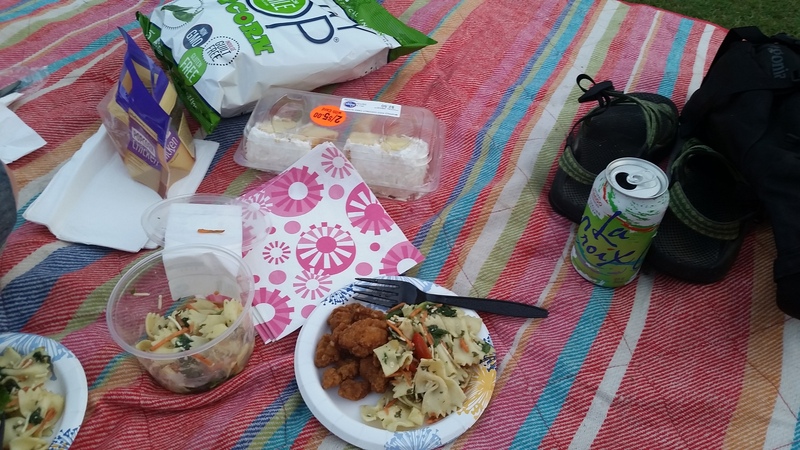 We stopped at Kroger and grabbed some basics – popcorn chicken, pasta salad, and slices of cake – and paired that with the popcorn and drinks from home. It was a perfect night – actually starting to feel like fall and I had to put my long sleeve shirt on! I love being outdoors and I love food – so picnics are the perfect past time. And the show wasn’t too bad either….though not the same as viewed as a child. If you’ve never been, it starts at dark (not even dusk, but dark), but get there at least an hour early if not before. Just throw your blanket down then there is plenty to keep you occupied, including people watching (my other favorite past time). Categories: Fun Friday | Tags: 30 before 30, picnic, stone mountain | Permalink. Two big items crossed off my 30 before 30 list this past weekend! I traveled up to Ohio (#13 – a new state) to visit friends and run the Capital City Half Marathon (#2 – a new half marathon)! I was very pleasantly surprised by Columbus, OH – it was homey and cozy and fun! I don’t know exactly what I expected, but it was a great city. All of the food we had was great and we visited the conservatory (which was free for me thanks to my local garden membership). The tulips were in full bloom and beautiful. We drove around campus and some different little neighborhoods, and between that and the race I pretty much saw all of Columbus! As much as I was impressed with the city, I was blown away by the Capital City Half Marathon. It was the best race I have ever done. Not only was it my personal best – crushing my old best time by 9 minutes – but it was SO well organized. There was great music and audio at the start line, the course was beautiful (and mostly flat – thanks Columbus), and most importantly, the finish line was ideal. If you’ve never won a race, the finish line/area is super important, especially for a longer race like a half or full marathon. You don’t want to run for hours then come to a stop in a pack of people. This race was the best finish I’ve ever seen – medics on hand as soon as you crossed the finish (that I luckily did not need), medals being handed out on both sides, water available right away, fences to keep the spectators out of the way, food shortly after the water, and they kept people moving to not block up everything (which is usually the major issue). If you are trying to find a race, I highly recommend this one. Categories: Merry Monday | Tags: 30 before 30, Columbus, half marathon, Ohio, race, running | Permalink. Cross off #3 on my 30 before 30 list – and it was a record-breaker! Six months left to finish the list! I’ve expressed before how much I like 5Ks – and it still holds true. Those are the races where I can really challenge myself and see improvement. And I set my personal best with the 420 Fest 5K! It was good and bad timing – I’ve been training for a half marathon so obviously could say I’d trained well, but it did cause me to not get in a great long run last weekend. Oh well! It was made greater because it was a friend’s birthday and her first 5K, and another friend who met us there was having her bachelorette party! I did learn a major lesson with this race though – ALWAYS use the porta-potty before the race. Whether you feel like you need to go or not. I don’t know why I didn’t – I think I thought we had less time than we really did and I really didn’t have to go – until I actually started running. Lesson learned. Will never happen again. Longest 25 minutes of my life ha. Anyway – personal record set: chip time of 25:12, 8:09 pace, 8th in my age group out of 241 women! And lots of fun – would definitely consider doing this race again (even with the giant hill to the finish line….not cool Zulu racing). Categories: Merry Monday | Tags: 30 before 30, 5K, race, Sweetwater | Permalink. Almost done with #3 on my 30 before 30 list! The Cooper River Bridge Run is a popular and fairly unique race in Charleston, SC. I have wanted to do it for a few years now and finally pulled the trigger. So two friends and I road tripped to Charleston, where, incredibly, 4 of our college friends live, to run last weekend! Let the half training continue! Categories: Merry Monday | Tags: 10K, 30 before 30, Bridge Run, Charleston, race | Permalink. #8 from my 30 before 30 list is done – I’m over halfway done! About 2 years ago I bought a Groupon for 20 classes to Red Hot Yoga. Luckily they accept them whenever – literally no expiration date – so I finally started to use it at the beginning on the year. Mostly thanks to another friend who wanted to go. Yoga is great, especially if you typically hit the cardio and/or weights hard. Stretching is important – and I don’t do it nearly enough for as much as I run. And as I have discovered lately, training for a half marathon at 29 is definitely different than training at 24. I know it sounds silly but it is – if I don’t stretch now I pay for it. Insert yoga. Especially since I’m training for a half marathon right now, it feels great. And I am not flexible at all, so don’t use that as an excuse. It really does help you become more stretchy the more you do it! And actually the heat (this is hot yoga) helps even more. The heat is actually what scared me the most, but I go early morning and it actually feels awesome. This studio is great because you don’t feel like a fool – there are always other beginners and they are pretty good about making sure you are doing all the poses correctly (otherwise it’s kind of pointless). I still have about 10 classes left on my groupon and we’ll see what I do when that is up but I’m hoping to keep going at least once a week! Now if I can only get in the habit of stretching on my own…. Categories: Sunny Sunday | Tags: 30 before 30, exercise, red hot yoga, stretch, yoga | Permalink.